Avalon is proud to present the MycoMate® Mycelium XL-Box. This McKennaii XL-MyceliumBox is an enhanced Myceliumbox with 80% more substrate. This XL-MyceliumBox contains the mycelium of the Psilocybe cubensis 'McKennaii' strain. The McKennaii mycelium is colonized on a substrate of rye and perlite. The top layer is covered with vermiculite. 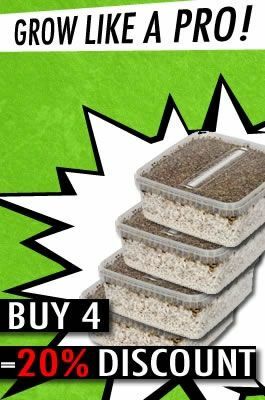 Holding the double of the substrate, meaning the double of the expected McKennaii yield, the XL-MyceliumBox is an enhanced product allowing the formation of exceptionally big McKennaii mushrooms in an exceptional short amount of time. Made for the amateur mycologist, the McKennaii XL-MyceliumBox highly reduces the probability of contamination and it's simplicity of processes will allow you to better focus on the amazing formation of mushrooms bodies. Made with the strongest redefined strains, growing mushrooms was never easier and more reliable. Super product, perfect delivery, harvested huge amount 7 times in a row !! Keep it up avalon ! !